At Triad K9 we are committed to keeping our German Shepherd puppies pure, healthy and of exceptional quality. 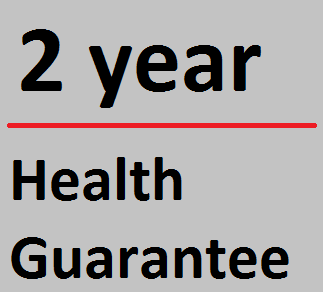 We offer you a worry-free 2 year health guarantee that we stand behind 100%. 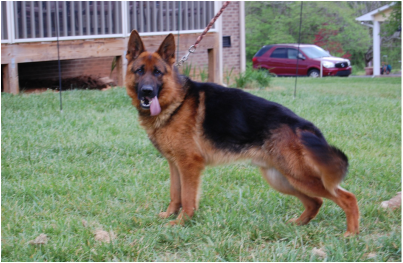 We are a German Shepherd breeder that maintains healthy adults and consistently produces top quality puppies. All of the puppies in every one of our litters are healthy and well nurtured. We have an exclusive whelping program that each pup goes through from birth until they go home. We work with each one as they grow up to make sure we provide you with the best companion you could ask for. We have excellent facilities to provide our adults and puppies with the highest level of care. Our kennels are heated and cooled with superior indoor air quality in mind. We provide a maximum level of sanitation to ensure incredibly healthy puppies. Each puppy will be Veterinarian certified with the first round of vaccinations administered. Puppies will be matched to customers specific needs. If you would like to reserve a puppy, there will be a $200 non-refundable deposit. The pups will stay with us until they are 8 weeks old, then they will be ready for their new homes. If you have a specific color or style that you want, feel free to contact us about our planned litters. Please take your time looking for the right puppy. If you are picky about where your puppies come from and have high expectations of a breeder please give us a call. 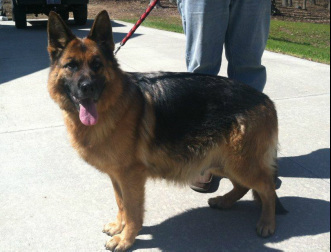 We welcome all to our home to see the difference in our German Shepherds. He is an excellent sire to our litters. A very strong and expressive dog. Has an exceptional temperament and character. His impressive red color pigmentation improves the look of the breed. He has great muscle structure and strength. Very obedient and is easily trained. Son of the World Champion VA10 Panjo Vom Kirschental. Puppies from this litter will have super pigmented saddle-back black and red short stock coats. They should weigh in the range of 75 to 90 lbs. The parents of this litter are absolutely gorgeous, truly a must see. They are both of exceptional quality and have excellent pedigrees. We look forward to producing this litter all year. This is definitely the litter to get your puppy from if you are looking for the all in one package. This litter is perfect for the family environment and for protection! These remarkable Shepherds are very gentle with children but will react fiercely to a known threat. These puppies will need a lot of attention and will actively pursue you companionship. The sire and dam consistently produce highly intelligent fun loving pups year after year and is one of our favorite litters we provide you. If you would like to be on the reservation list to get a puppy give us a call. Our pups usually sell out very fast so don't wait to call!